This Blister Beetle was busy feasting on pollen in a Desert Sunflower (Geraea canescens). East of Parker, La Paz County, Arizona, USA. 14 March 2010. 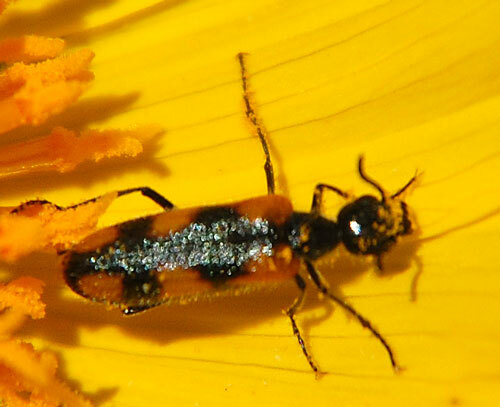 Meloidae, or Blister Beetles, are common insects found on flowers especially during spring time in the Sonoran Desert. They feed on the petals and pollen as adults but live an entirely different life as immature larvae. The adults tend to have bright, aposomatic coloration set off by black. This is a warning that these beetles often contain noxious or poisonous compounds; birds and other insectivores tend to avoid meloids. The larvae are parasitic in the nests of ground nesting bees or other ground nesting insects. The tiny, first stage larvae are mobile and seek out a suitable host. Once they attach to a host they become immobile drawing sustenance as they grow. The colorful species at left is about 12 mm long. The pattern on the elytra (shell-like wing covers) varies between populations resulting in a number of named subspecies or varieties. Some varieties have the orange on elytra reduced to patches on the shoulders. Copyright Michael J. Plagens, page created 16 March 2010.